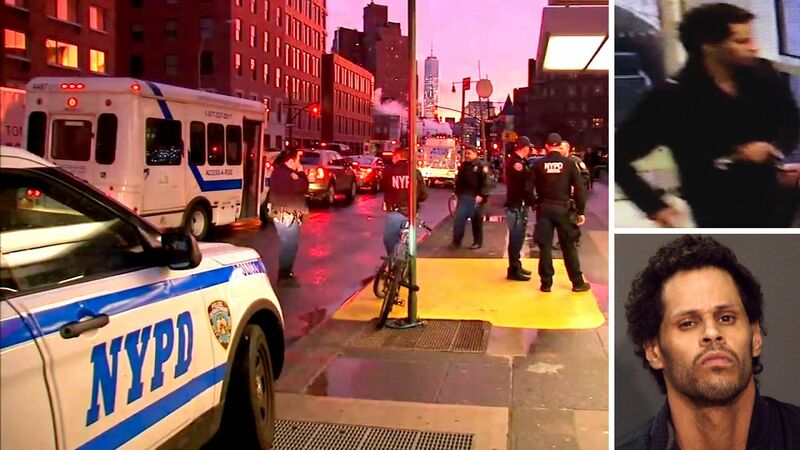 GREENWICH VILLAGE, Manhattan (WABC) -- The New York City police officer who was supposed to be guarding a prisoner who escaped from a Manhattan hospital has been suspended. Law enforcement sources tell Eyewitness News that NYPD Officer Albert Belcher was talking on his cellphone while he was supposed to be guarding the suspect inside the Lenox Hill Healthplex in Greenwich Village. The officer had taken 32-year-old Daniel Ortiz to the hospital after he was arrested on shoplifting charges at Macy's in Herald Square. Ortiz was bleeding during police processing because he had been stabbed three days earlier. Officer Belcher took him to the hospital for treatment, handcuffing his right hand to the hospital bed. The officer had removed the shackle from the suspect's ankle so doctors could treat him. The officer then left the room to talk on his cellphone for four minutes, per surveillance video reviewed by the police department. When he returned, Ortiz had escaped. He went out a back door of the hospital and was not wearing a shirt at the time of his escape. He was last seen entering the subway station at Seventh Avenue and West 14th Street. His leg shackle was still believed to be attached to his left ankle at the time of the escape.